A little princess makes the greatest of gifts from the simplest of lists. When a neighboring kingdom announces the birth of a royal baby, the Queen of Iddison is thrilled. "We shall bring the child splendid gifts," she declares, and then makes a long list of treasures to collect on the way. She smiles as her daughter, little Princess Cassidy, makes a list, too. On the voyage, the Queen checks her list as the royal caravan gathers gems from mountain mines and beasts from deep jungles. Princess Cassidy also checks her list, but collects nothing. At last, the royal caravan arrives laden with riches. But it is only the gifts from Cassidy's list that make the baby smile its first smile. And the Queen smiles too when she reads it: two kisses (X X) and one hug (0). 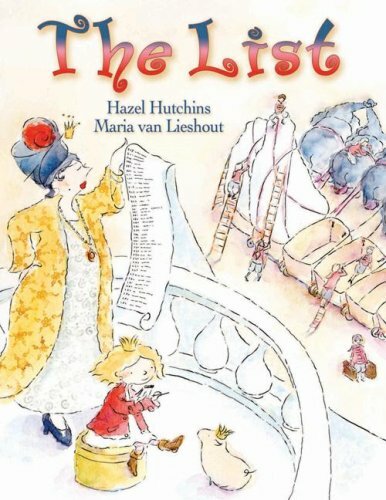 The List is a poignant tale from a gifted storyteller, full of whimsically charming artwork and heartwarming truth. About Hazel Hutchins (Author) : Hazel Hutchins is a published author of children's books. Some of the published credits of Hazel Hutchins include Mattland, Second Is A Hiccup, The List.